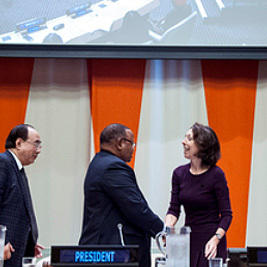 On 27 July, Ambassador Marie Chatardová became the seventy-third President of the Economic and Social Council (ECOSOC) – the body at the heart of UN’s work to advance sustainable development. “I wish to announce that the key priority of my Presidency will be to develop initiatives towards fostering sustainable, resilient and inclusive societies through participation of all,” said Ms. Chatardová, after her election by acclamation. The Permanent Representative of the Czech Republic to the UN, Ms. Chatardová noted on her first day on the job the several positive developments towards reaching the 2030 targets. She said that despite unprecedented technological advancement and innovation, the world continued to experience rising inequalities in most countries. “If multilateralism is to stay relevant in this evolving context, we need to take these challenges seriously, and work on devising solutions to address them. I believe that the ECOSOC system has a key role to play,” she said. To explore further collective action on the issue, the new President announced her intention to convene an ECOSOC Special Meeting at UN Headquarters in May 2018. “We must work together and make all efforts to achieve what we have set out: ‘to leave no-one behind.’ Truly no one!” she said. Until her appointment as Permanent Representative to the UN in 2016, Ms. Chatardová was her country’s Ambassador to France and Monaco, and its Permanent Representative to the International Organization of la Francophonie. Between 2013 and 2016, she also served as Permanent Representative to the United Nations Educational, Scientific and Cultural Organization (UNESCO). Ms. Chatardová was awarded Commander of the National Order of the Legion of Honour of France in 2016, and Officer of the Order of Saint-Charles of Monaco in 2016. She holds a doctorate of law from Masaryk University in Brno, Czech Republic.